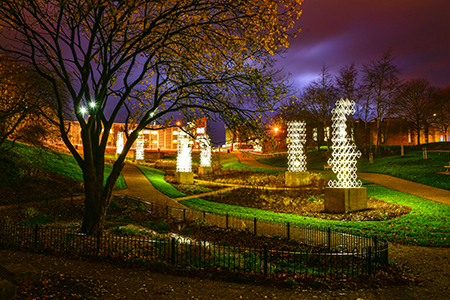 Winsford Town Park by night has become as attractive as it is in the day after work was completed to light up its art structures. 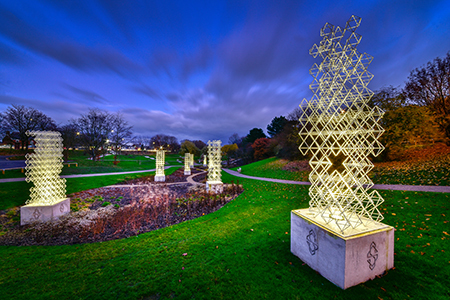 Lighting has been put in place to illuminate the park’s Seven Sisters, which were designed by public artist Liam Hopkins from creative studio Lazerian. 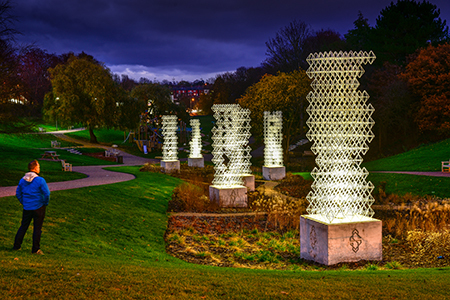 They are designed to reflect the multiple chimneys which dominated Winsford’s skyline in the 1800s to 1900s, nicknamed The Seven Sisters, and honour the impact the salt industry has had on the town. Councillor Brian Clarke, Cabinet Member for Economic Development and Infrastructure, said: “Winsford Town Park has become a popular place for families since it was reopened to the public last summer following a major investment by Cheshire West and Chester Council. Town Park was transformed into an attractive space last summer following a £900,000 investment by Cheshire West and Chester Council in partnership with Winsford Town Council. It was re-designed by Cheshire West and Chester Council’s Total Environment Team. Its new facilities range from a children’s play area to wildlife ponds and exercise equipment. Tony Hooton, Chairman of Winsford Town Park steering group, said: “The town park has turned out to be a great success, it looks really good, lots of interesting exciting feature such as a children’s play equipment including the art sculptures at the top of the park. “There are eight of them which represent the salt chimneys of Hamlets salt works. They look good in the daylight but now that we have got the lighting on them they look good in the evening too. The Friends of Winsford Town Park welcomes new members willing to volunteer their time helping to maintain the park. For information contact John Malam, Chair, Friends of Winsford Town Park on hello@fowtp.co.uk.